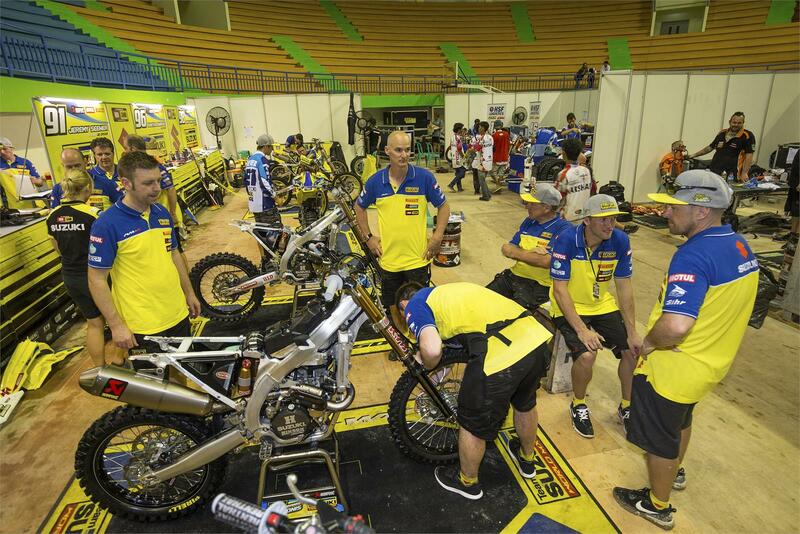 Wim van Hoof is responsible for Fuel Ignition and Mapping for the Suzuki World MXGP & MX2 RM-Z machinery and also engine blocks on the MX2 machines. I was born into a motorsport family. My uncle, Willy Maes, rode motocross in the 1960’s and was two-times Belgian Motocross Champion. Furthermore, my dad was also into motorsport and then in the end, of course I started riding a motorcycle myself. From 1997 until 2008 I worked for a company in Antwerp where I was working with injection systems every day. I was responsible for the repairing and calibration of motorbike and car injection systems. For six years I was chief mechanic over there. This year is my seventh season on the GP circuit. The first years I was race mechanic and then in my third year I started preparing the engine blocks as well. Later I was chief mechanic and I was also responsible for R&D. Although I have already some experience in the GP circuit, I only joined the Suzuki World MXGP team in November 2016. It was Stefan Everts who contacted me by phone in October. I went for an interview and I immediately had a good feeling. The overseas races are now done and dusted. I’m actually quite happy about that. It’s not that I don’t like those races, in fact those races are really nice. It’s just very exhausting because of all the travelling. If you’d ask me what my favourite overseas race is, then I’d say Argentina. Without a doubt. It’s such a beautiful country. The nature is beautiful, it’s quiet, the people are really nice and the organisation of the race is certainly on point. A lot of spectators and a good atmosphere. In a country like Argentina, you quickly forget about the long and tiring travelling! But still, now that we’re back in Europe there’s more time for the development of the engine blocks, so bring on the rest of the season!